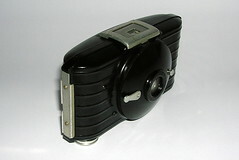 This small 127 (4 × 6 1/2 cm) of 1936 is characteristic of the Kodak design service of the time (Art Deco). It forms part of an Art Deco design family together with the Kodak Baby Brownie and unquestionable Kodak Bantam (all designed by Walter Dorwin Teague). The design of the bakelite Kodak Bullet is very simple. Its lens is assembled on a helicoid slope, at the end of which a shutter release is located. The Bullet name was reused later, as the Brownie Bullet.